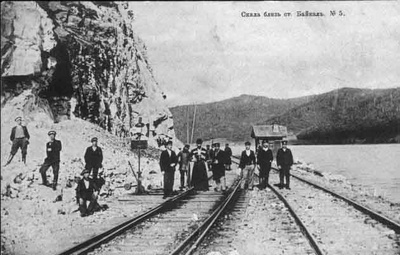 21st July 1904; Decreed by a Czar, built by thousands of workers over a period of more than a decade, the Trans-Siberian Railway is officially completed. As you’d expect with a project of this size, complexity and scope, “officially completed” is a relative term. Trains have already been operating on parts of the line for some time, while other sections won’t be up and running for years. The idea of a rail link connecting European Russia to Siberia and the remote Far East had been kicking around for years before the decision was made to build it. Despite the pleas of Siberian provincial governors, who were saddled with a terrible transportation infrastructure made worse by an inhospitable climate, the powers-that-be back in St. Petersburg (the capital of the Russian Empire in those days) were not enthusiastic. Siberia might be the seat of the thriving fur trade and a swell place for exiling criminals, but the cost estimates were staggering — 350 million in gold rubbles was the original projection — as were the logistical hurdles that would have to be overcome. Finally, Czar Alexander II green-lighted the project. Unfortunately, things stalled again with the Czar’s assassination in 1881, and it was left to his successor, Alexander III, to issue the formal resolution in 1886. Part of his resolution included a mea culpa to the long-suffering provincial governors and a tacit acknowledgment that a trans-Siberian railroad would be an economic boon to the empire: I have read so many reports from the Siberian governors that now I can admit with sadness that the government did almost nothing to satisfy the needs of this rich but neglected region. It is time to correct this mistake. Correct it they did, beginning in 1891, with one of the most ambitious engineering projects of all time. Like the building of the transcontinental railroad in the United States, work on the Trans-Siberian Railway commenced at either end with the goal of building to an eventual meeting point. Much harsher conditions prevailed in Russia, however, so the work was often sporadic in nature, requiring the simultaneous efforts of many thousands of skilled and unskilled workers. The official railroad committee set up to oversee construction announced, rather loftily, that “Siberian railway construction is a great national event; it should be built by Russian people with Russian materials.” Most of the labour was, in fact, Russian, but plenty of foreign help was used, including Finns, Poles and even the odd Brit. Regardless of what language they spoke, they had their work cut out for them, especially those charged with construction in the more inclement parts of Siberia. 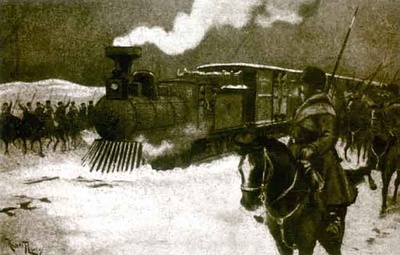 In order to lay rail, they had to hack their way through dense virgin forests, bridge fast-moving rivers, negotiate vast tracts of swampland, blast tunnels through mountains and dynamite the permafrost layer that covers so much of the Russian Far East. Just to up the ante a little, the bulk of the construction was done without the benefit of heavy machinery. Shovels and picks, along with a little dynamite, made up the railroader’s basic work kit. In addition, workers had to deal not only with extreme cold, but with a variety of other impediments as well: floods and landslides, armed bandits, cholera, anthrax … even an occasional tiger. When the line was finally up and running, trains passed through a veritable who’s who of Russian and Siberian towns and cities: Nizhny Novgorod, Yaroslavl, Yekaterinburg, Omsk, Novosibirsk, Krasnoyarsk, Irkutsk, Ulan Ude, Khabarovsk, Vladivostok. The Trans-Siberian hauled under steam. Although the conversion to electricity began as early as 1927, the last steam engine wasn’t retired until 1987. As expected, the advent of the Trans-Siberian Railway opened up Siberia to the rest of the country. People flowed east, and Siberian agricultural products flowed west. The modern Trans-Siberian railway is not merely one route but four, although the name is usually associated with the transcontinental line beginning at the Yaroslavsky rail terminal in Moscow and terminating nearly 6,000 miles and seven time zones to the east in the Pacific port city of Vladivostok. If you board a train in Moscow, intending to make the entire trip, bring along plenty to read, even if you’re aboard a train that makes relatively few stops. Train No. 002M, the closest thing to an express on the Trans-Siberian, takes just over six days to reach Vladivostok, assuming it stays on schedule. Other routes utilizing parts of the Trans-Siberian main line were built under Soviet rule, branching off to such exotic locales as Manchuria, Mongolia and North Korea. The Moscow-Pyongyang run of nearly 6,400 miles is the longest single continuous rail service in the world.